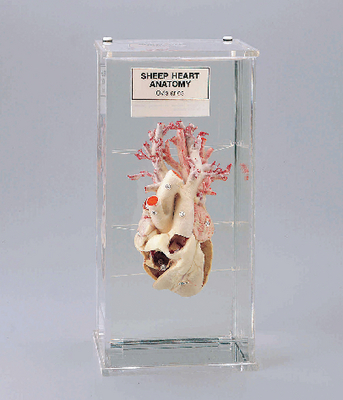 Shows the functioning areas of a mammalian heart. Key Includes 1. Tricuspid Valve; 2. Bicuspid Valve; 3. Semi-Lunar Valve; 4. Septum; 5. Right Ventricle; 6. Left Ventricle; 7. Right Auricle; 8. Left Auricle; 9. Chordae Tendinae; 10. Papillary Muscles; 11. 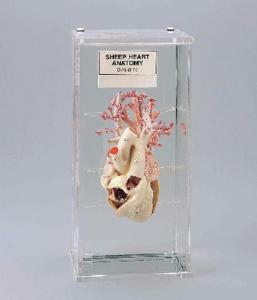 Pulmonary Artery; 12. Aortic Arch; 13. Anterior Vena Cava; 14. Posterior Vena Cava; 15. Innominate Artery; 16. Coronary Vessels.